An added bonus of the healing properties of manuka honey. The label or website doesn’t say how much CBD is in the balm. 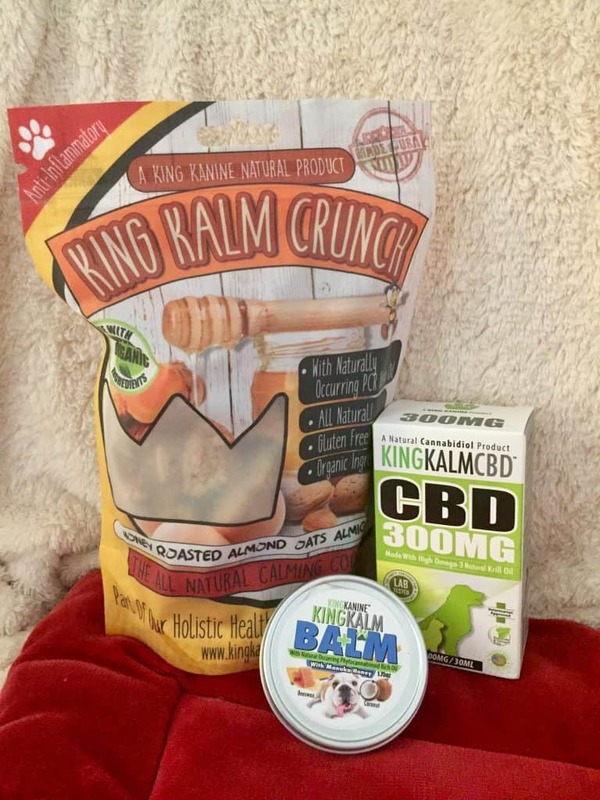 The King Kanine’s mission is to provide our furry friends with high-quality and organic CBD products to help your pets feel good on the inside and outside. People from around the world enjoy these pet-friendly, pharmacist formulated CBD products. Last year, King Kanine was awarded the Golden Paw Award from the Mayor’s Alliance for NYC Animals for its commitment to helping animals. Not only do they provide award-winning products to help relieve your dog’s anxiety or chapped paws, but they also raise funds and awareness for the American Society for the Prevention of Cruelty to Animals in order to protect animals that may not be with loving families. The company is dedicated to providing pet owners with information through their website and social media platforms so you and your pup can live educated, happy, and healthy lives together. Some of King Kanine CBD products. 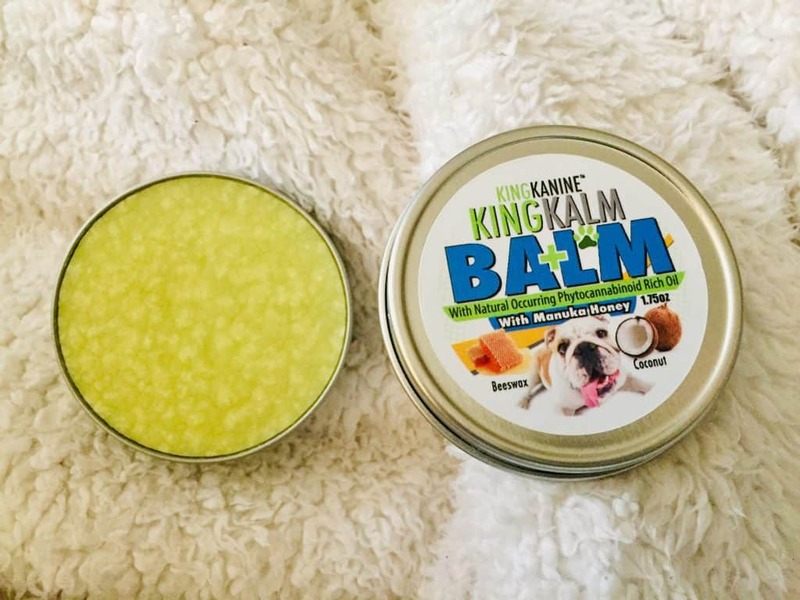 I was stoked to try the King Kalm Balm on my friend’s dog, Grady, who always has bug bites from his adventures chasing squirrels and running around the Santa Monica Mountains. He scratches and licks the bitten area until there’s a bald spot, revealing a red patch of inflammation. Grady’s mom and I are hoping the King Kalm Balm will fight inflammation and the manuka honey will serve as a natural antihistamine for poor Grady’s bug bites. With the help of his mom, I smeared a little of the balm on Grady’s bites. The balm smells like cocoa butter, and as a human, I have a hard time not licking cocoa butter, so I wasn’t surprised that Grady immediately went to lick the balm. We scolded Grady every time he went to lick it, and being a good boy, he eventually stopped. 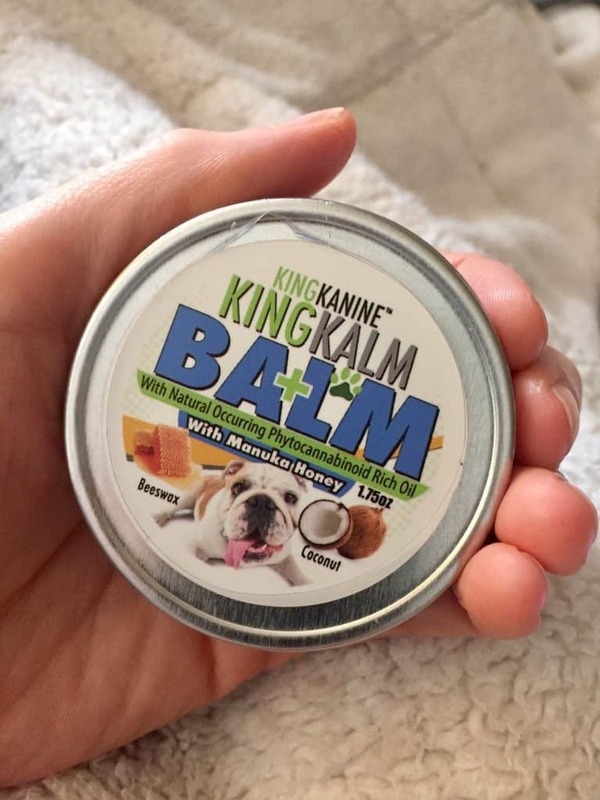 The best trait of the King Kalm Balm is the fact that it has all-natural ingredients, so when Grady inevitably goes to lick the sweet-smelling substance that’s been slathered on his belly, he’s not ingesting anything that’s bad for him. And let’s be frank, dogs will lick unmentionable things, so we have to assume, they will go for it. The King Kalm Balm is also an effective alternative for veterinarian prescribed salves. After a few days of applying the balm to his bug bites (and reminding him not to lick it off), the redness dissipated, the bites began to heal, and we could see tiny hairs starting to grow back. 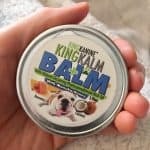 I would definitely recommend the King Kalm Balm to folks with adventurous dogs. Before using the King Kalm Balm, I had no idea how amazing manuka honey is for animals and for humans. The honey, made by bees that pollinate manuka bushes in Australia and New Zealand, has been used for centuries to treat dermal infections because of its antibacterial properties. The components of the honey have also been known to ease pain and inflammation of wounds. Professional-looking tin labeled with important information; however, the tin nor the website reveals how much CBD is in it. The balm really helped my friend’s dogs bug bites. All-natural, potent, helpful, and unique ingredients. The balm smells amazing, like cocoa butter. The balm inexpensive for a CBD product with such amazing ingredients. The 1.75 oz of the balm is currently only $16.99, which is the cheapest CBD balm I’ve ever seen. The King Kalm Balm is also unique amongst the competition because it uses manuka, honey. 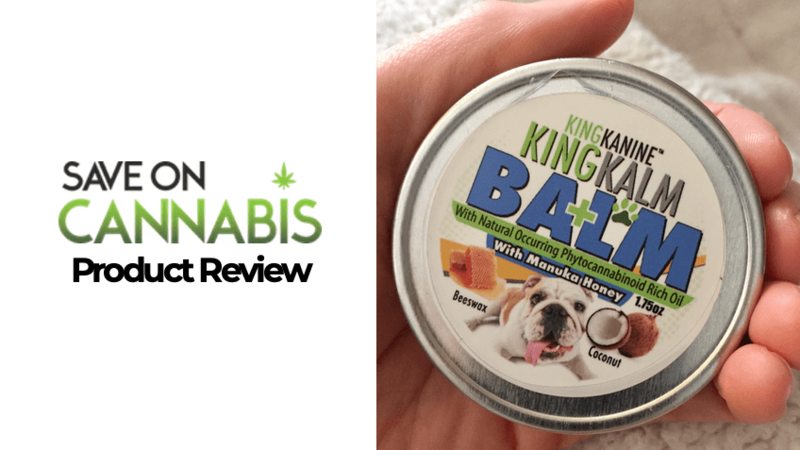 I’ve seen some manuka honey oils and balms for pets (and humans) on the market, but they do not also have the added infusion of cannabis, and they are far more expensive. 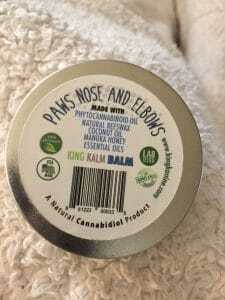 I like the price so much with King Kalm Balm, I may have to get some for my human friends too. Save money with CBD pet product coupons here at Save On Cannabis the World’s largest online cannabis coupon code directory.